2016 has been a very mixed year for the environment. Despite some positive developments for conservation over the past year, there are even greater threats to public and ecological health looming on the horizon. We have a lot of work ahead of us in 2017, but your support can help us continue to hold government and industry accountable in the new year (while giving you a break on your taxes for 2016). Over the past year, documents came to light proving that federal officials made misleading and unsubstantiated edits to a major report from the Environmental Protection Agency (EPA) on the threats posed by hydraulic fracturing (aka fracking). SkyTruth was among the first in 2015 to specifically identify the inconsistencies in the draft report, but at least the final report more accurately quantifies the extent of known cases of contamination from fracking. However, while low oil and gas prices have slowed some of the push for new fracking and drilling, pipelines have emerged as a new point of contention. The Army Corps of Engineers has delayed approving a river crossing for the controversial Dakota Access Pipeline, but as we wrote this month there are many more pipeline projects underway – all of them posing risks to public safety, clean air, and clean water. Above: Footage from the 2010 Enbridge Oil Spill into Michigan’s Kalamazoo River. Off the coast of the United States, President Obama recently withdrew millions of acres of Arctic and Atlantic waters from offshore drilling. This environmental victory is the result of numerous environmental campaigns over many years, including our efforts to document the risks and accidents associated with new drilling. Additionally, President Obama is moving quickly to protect some areas from new offshore oil drilling before Donald Trump takes office in January 2017. 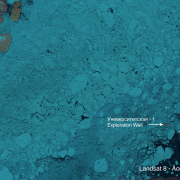 We’ve already documented some of Exxon’s drilling activity in Russian Arctic waters (below), but we will have to be even more vigilant if ExxonMobil CEO Rex Tillerson becomes Secretary of State. Unfortunately, little has changed in the Gulf of Mexico where even after a court settlement negotiated by our partners at the Waterkeeper Alliance, Taylor Energy platform #23051 continues to leak. 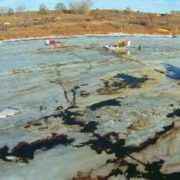 Taylor Energy, however, is now reneging on their responsibility to contain the ongoing leak, and is suing the federal government to recover $423 million out of $666 million which they were compelled set aside for cleanup and containment. In July, a federal appeals court again upheld an EPA decision to revoke a massive mountaintop mine expansion permit in Logan County, West Virginia. The EPA decision was supported by scientific studies on the health and environmental impacts of mountaintop removal coal mining, some directly informed by SkyTruth’s satellite derived mountaintop removal footprint data. Yet across Appalachia, Trump and other pro-coal politicians won overwhelmingly on the promise of bringing back coal jobs. These promises likely mean decrease in regulatory oversight and cutting enforcement capability, so we will need satellites and citizen scientists to be even more vigilant. Out at sea, things have been looking up. In partnership with Google and Oceana and with keynote addresses from U.S. Secretary of State John Kerry and actor/ocean advocate Leonardo DiCaprio, we officially launched the first public version of Global Fishing Watch. Our work using satellite data to track suspicious vessel activity on the open ocean has been chronicled in the New York Times Magazine, helped bust a Chinese fleet illegally using drift-nets in the southern Indian Ocean, and prompted the government of Belize to halt seismic testing around a protected reef – sending an oil and gas survey vessel packing. But we can’t do it alone, which is why we are making tools like Global Fishing Watch open to the public for all to use. We believe governments and businesses work better to protect the environment, and to ensure human health and well being, when the consequences of their action and inaction are plain for all to see. Persistent public vigilance has always been necessary for a functioning democracy. It’s especially crucial when governments are disdainful of environmental protection and public health and safety, dismissive of science-based decisionmaking with public participation, and openly hostile toward the public ownership and long-term stewardship of our lands and waters. This means we need you. We need your support, your engagement, and your vigilance. If you can see it, you can change it. On Sunday, Dec. 4 the Army Corps of Engineers issued a decision which will again delay construction of the Dakota Access Pipeline (DAPL). The ruling was cheered by water protectors entrenched in the path of the pipeline at the Standing Rock Sioux Reservation. These representatives of indigenous nations, environmental activists, veterans, and many other groups have been resisting pressure from private security and law enforcement officers from at least 76 different state and federal agencies or departments, as well as enduring sub-zero blizzard conditions. However, the ruling does not definitively end the controversy, it only delays the decision until further environmental impact studies are conducted. Unfortunately the choices before the Army Corps appear to be limited, given the fact that as much as 87% of the North Dakota portion of the pipeline is already complete, and nearly 50% of the almost $3.8 billion dollar project is completed and/or in the final stages of cleanup and reclamation. Furthermore, any further environmental impact study and public comment for the Army Corps could easily hand the decison over to Trump Administration which has expressed support the pipeline (despite the obvious conflict of interest with the President-Elect owning stock in several of the key companies involved). So while hands are wrung and ink is spilled on the specifics of this pipeline, let’s take a look at why people around the world are rallying in opposition to ANY new pipelines. The short answer is 1) accidents happen, and 2) they are multi-million dollar investment projects which further lock us into years, even decades, of fossil fuel extraction and emissions. You can explore this map of pipeline spills and releases from our friends at FracTracker, but what exactly do some of these incidents look like on the ground and in the water? Here are some of the most egregious cases from the past decade. Western North Dakota, near Belfield – December 5, 2016: Just this month, less than 150 miles from Oceti Sakowin Camp, a leak was discovered in the Belle Fourche pipeline. An estimated 176,000 gallons leaked and crews are reportedly testing whether or not they can burn some of the spilled oil to stop further spread of the oil. 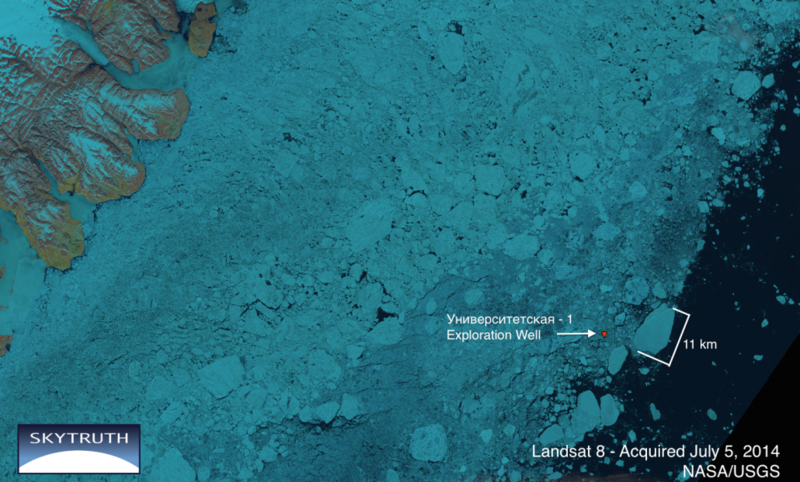 As of Dec. 15, ten days after the spill was discovered, less than 1/3rd of the oil had been recovered. But this is the not the first time that True Companies, the pipeline operator, has been in the news. 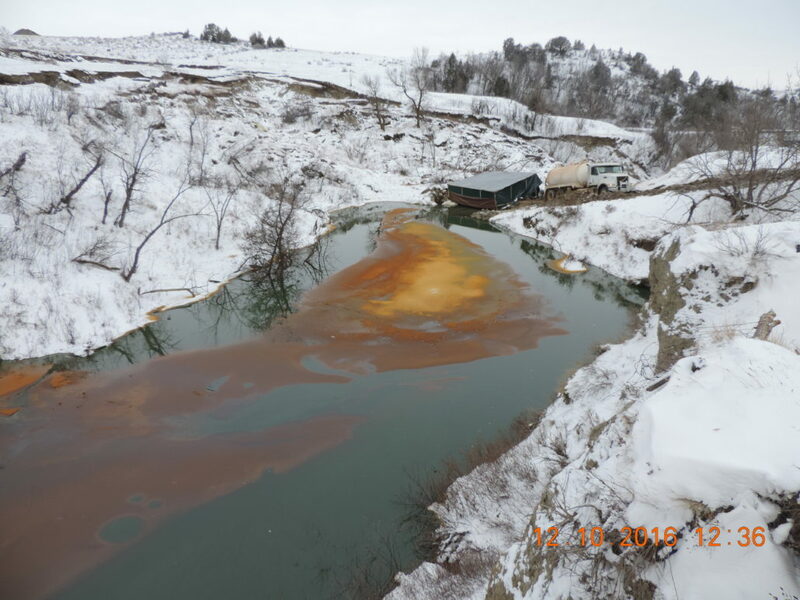 Yellowstone River, northeastern Wyoming – January 17, 2015: True Company/Bridger Pipeline’s Poplar oil line leaked 32,000 gallons of oil into the Yellowstone River, a tributary of the Missouri River (and by extension, upstream of Standing Rock). The pipeline was supposed to be buried eight feet beneath the river bed, but after the spill investigators discovered that the pipeline had become completely exposed. And it wouldn’t be the first time for the Yellowstone River. In July 2013, an Exxon pipeline also leaked 63,000 gallons of oil directly into a different section of the river when it too became exposed and was damaged by flood debris. Oil is hard enough to remove from water, but what about when that oil sinks? Fittingly, the Enbridge spill quickly became Exhibit A in the fight against the Keystone XL pipeline which was ultimately rejected by President Obama in 2015. While scientists and activists debated whether or not tar sands bitumen diluted for transport was more corrosive to pipelines than regular oil, another major tar sands pipeline would make headlines. Mayflower, Arkansas – March 29, 2013: In a quiet Arkansas suburb, Exxon Mobil’s Pegasus pipeline burst, spilling an estimated 210,000 gallons of tar sands bitumen through a residential subdivision and into nearby Lake Conway. With assistance the Arkansas Chapter of Sierra Club, we used satellite imagery taken before and after the disaster to document the impact on the community and nearby public lands. But it is not just the United States concerned about new oil pipelines. Our neighbors in Canada have also had their fair share of pipeline accidents and have their own slate of new pipeline projects concerning them. Burnaby, British Columbia –July 24, 2007 : On a warm summer afternoon in British Columbia, a contractor’s backhoe struck the Transmountain Pipeline near Westridge, releasing a gusher of over 59,000 gallons of crude oil into a residential neighborhood. But in 2016, Canadian Prime Minister Justin Trudeau recently approved Kinder Morgan’s plans to expand the Transmountain Pipeline, while making moves to block Enbridge’s Northern Gateway pipeline. In addition to spills on land, locals are deeply concerned about the risk of oil spills from increased oil tanker traffic along the coasts. Those concerns were brought back to the fore when a tug boat, the Nathan E. Stewart, ran aground near Bella Bella, B.C. while pushing an empty fuel barge. Even without any cargo in the barge, fuel and hydraulic fluids from the tug contaminated the shoreline and shellfish beds while it took over a month to extract the Stewart from its watery resting place. These spills have all focused on oil pipelines, but natural gas and refined petroluem pipelines pose their own unique threat. Sissonville, West Virginia – December 11, 2012: Here in the Mountain State, an aging 20-inch transmission line exploded a few years ago, enveloping Interstate 77 in a wall of flames and destroying several homes. Fortunately there were no fatalities. The pipeline was constructed in the 1960’s. Salem Township, Pennsylvania – April 29, 2016: More recently, a thirty-inch gas transmission line in western Pennsylvania exploded, destroying a house and hospitalizing a 26-year-old with third-degree burns over 75% of his body. The Spectra Energy transmission line was installed in the 1980’s. Shelby County, Alabama – Oct. 31, 2016: An excavator conducting repairs from a prior incident on the Colonial Pipeline struck the massive gasoline transmission line, causing a fiery explosion and ultimately killing two. The Colonial Pipeline provides the East Coast with 40% of the gasoline consumed and is the largest petroleum distribution system in the U.S.
As we have published before, even the Obama Administration has fallen short in addressing serious concerns surrounding pipeline safety. For all of the claims that modern pipelines will be safe and loaded with spill-prevention tech, we’ve yet to see clear evidence of this technology stopping major spills. Even in the Gulf of Mexico, Shell recently lost 90,000 gallons of oil from a subsea pipeline but the person credited with discovering it was not the pipeline operator, but a helicopter pilot who just happened to be passing by. Trans Mountain Pipeline – British Columbia, Canada. Oil pipeline. More info from Dogwood. Pacific Connector LNG – Oregon. Natural gas pipeline associated with an LNG terminal for export. More info on the pipeline and Jordan Cove LNG terminal at Citizens Against LNG. Buckingham Compressor Stations – Virginia. An infrastructure upgrade linked to the planned Atlantic Coast Pipeline. More info at Friends of Buckingham, Virginia. Atlantic Coast Pipeline – West Virginia, Virginia, North Carolina. Interstate gas transmission line. More info from Wild Virginia, Allegheny Blue Ridge Alliance, and Friends of Nelson County. Bayou Bridge Pipeline – Louisiana. Regional oil pipeline connecting major hubs with refineries. More info from Louisiana Bucket Brigade. Mariner East 2 – Pennsylvania. Intra-state gas liquids transmission pipeline. More info from FracTracker. Pilgrim Pipeline – New York, New Jersey. Interstate oil pipeline. More info from the Coalition Against Pilgrim Pipeline. Sabal Trail Pipeline – Alabama, Georgia, Florida. Interstate natural gas transmission pipeline. More info from Stop Sabal Trail Pipleline.